In December we were hit with a series of snow storms that left many people snow bound. 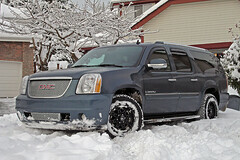 I was totally impressed by our GMC Yukon XL Denali's performance with the AWD and winter tires and I never got stuck--even though I tried :lol:. While my neighbors were busy shoveling their driveways so that they could get out, I refused to shovel mine and simply drove the Denali in and out of our garage. I even used a tow rope to pull out a neighbor's Jeep Cherokee that had gotten stuck on the slope in front of their house. I also picked up strangers walking in the street who waved me down for help. I gave them rides down the mountain because their cars were stuck, the buses weren't running, and the sidewalks weren't cleared. Walking in the road in conditions like that was just too dangerous. I bought 17" winter rims this season in anticipation of getting chains for my YDXL but I'm happy to discover that even with our record-setting snowfall this year, I've had no problems getting around very deep snow conditions. The only problem I had was going in snow that was deep and icy enough to rip off the black plastic lip under the front bumper. One side had ripped off making the mounting hole slightly bigger than the screw that held it in. I didn't want to risk having the entire lip rip off and losing it somewhere on the road, so I took it off. I'll re-install it in the spring. what tires are on it?